The first technique symbol on the key to the left is the Cable 4 left. This is a cable made up of FOUR stitches. Knit the two front crossed sts. I know this sounds complicated, so here’s a brief video I made a few years ago explaining my favorite method for Cabling with a Cable Needle. If you love to use a cable needle, please do so! I don’t want to change how anyone enjoys their knitting, I just want to add some extra bits that some of you may find helpful! I’ll be posting about my OWN knitting of my Split Cable Wimple, and here’s where you’ll come for tips and tricks and to ask questions in the comments. If I can’t answer your question(s) right away, I’m positive someone will jump in and give it a good try! First, and foremost, let’s discuss the symbols that are used in the pattern. 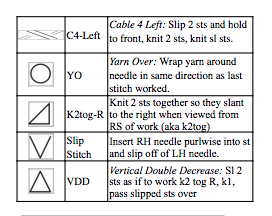 You don’t HAVE to use the chart, the pattern is written out for you, but when discussing the different techniques I’ll be referring to the stitch symbol to as well as the stitch technique name. In order to highlight a particular stitch, to draw attention to a vertical line in a pattern, often a stitch is “slipped,” or passed from the Left needle to the Right needle without forming a stitch. This forces the Slipped Stitch to elongate itself and become twice as tall as the stitches around it, which can create a lovely stitch pattern. 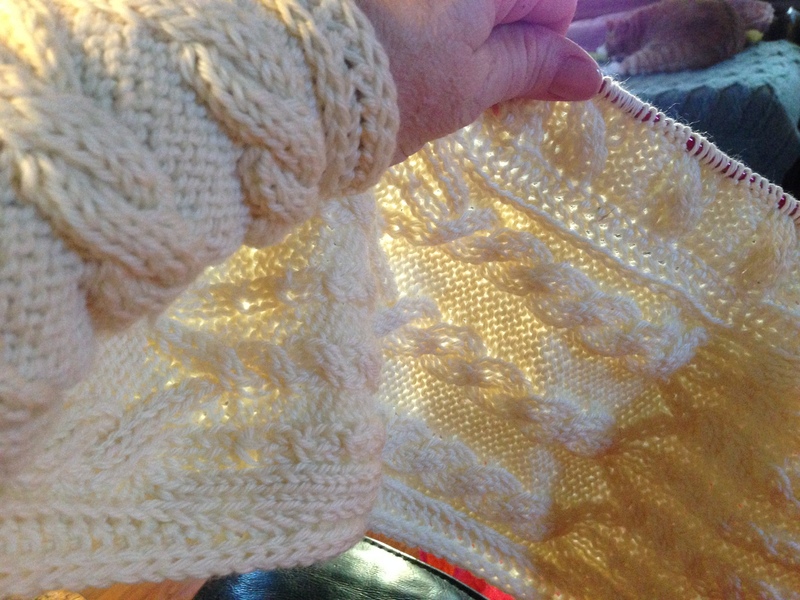 Work to the point where the Slip Stitch will happen. Insert the needle into the next stitch purl-wise (as if you were going to purl the stitch) keeping the yarn to the wrong side of the work. Slip the stitch from the Left Needle to the Right Needle. 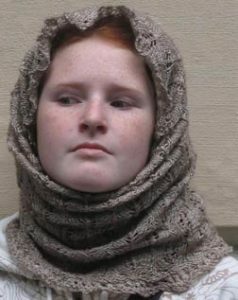 The slipped stitch will echo the look of a Vertical Double Decrease (see below) and is often used in lace knitting to emphasize a stitch pattern without actually decreasing any stitches. Sometimes called a “Yarn Forward” in the UK and Canada, a Yarn Over is the US name for a technique whereby we create an eyelet, or “hole” in the work. In lace knitting, the eyelet is the most recognizable element, it’s what makes lace look like lace! To form a Yarn Over, you’ll wrap the yarn around your working needle (usually the Right needle) in the same direction as you would wrap the yarn while making a knit stitch. DO NOT INSERT THE NEEDLE INTO THE NEXT STITCH! While the needle is ‘resting’ between stitches wrap the yarn around the working needle in the same direction as if you were forming a knit stitch. You’ve just formed a Yarn Over. One of the most basic decreases used in knitting will be what we call a K2tog-R. In most Western patterns this is called, “K2tog”, but I like to add the K2tog-R at the end of the technique name to reinforce that this decrease will slant TO THE RIGHT. A decrease will either slant to the left, to the right, or will be centered vertically. This decrease slants to the right. A simple way to remember what direction a decrease will slant is to note what direction the needle tips are pointing AS THEY ENTER THE STITCHES TO BE DECREASED! Insert the tip of the working (Right) needle into the 2nd st from the tip of the Left needle, then continuing on, insert the tip of the working needle into the 1st stitch at the tip of the Left Needle. The Left and Right needles will BOTH be inserted into the same two stitches at the tip of the Left needle, the needle tips will be pointing in the same direction. Wrap the yarn around the tip of the working (Right) needle, then draw this loop through BOTH stitches (see video below) thus working these stitches together. Kick the completed stitches off of the Left needle. As shown in the video below, as the needle enters the stitches to form a RIGHT Decrease, the tip of the working needle enters the sts to be decreased pointing to the RIGHT. I’m not going to cover the K2tog-L decrease here, which is usually called SSK or K2tog-TBL in most Western patterns. You can watch the video to see how to form it, and WHY I call it K2tog-L, but as it’s not used in this lace motif I’ll just leave it here for now. In our Wimple we’ll be using the K2tog-R technique and a different decrease technique called a VDD to create a Centered, Vertical Decrease which leans neither left nor right. A Vertical, or Centered, decrease will always involve an odd number of stitches; stitches to be decreased on either side of a centered stitch which will remain at the center of the decrease. Slip these stitches off together. DO NOT KNIT THEM, simply slip them off of the Left Needle onto the Right (working) needle. The stitches MUST be slipped together, do not slip them one by one. Pass the 2 stitches you’ve just slipped onto the Right needle OVER the single knit stitch you’ve just worked. You can pass the stitches one at a time, or together, whichever is easiest. You will have just formed a decrease which is vertically centered. You should be able to see the center V clearly. You have just decreased 2 stitches, turning a group of 3 sts into a single stitch. In our motif, the VDD is ‘bookended’ at either side with a YO. These two Yarn Overs will take the place of the stitches that you decrease in the VDD, keeping the number of stitches in the motif constant. More info tomorrow when we cover CABLES, another important element in our Split Cable Wimple.